Macular Degeneration - Dr. John D. Bissell O.D. Age related macular degeneration is the leading cause of vision loss in those over 65. By definition, macular degeneration affects only the macular portion of the retina. The retina, like film in a camera, is the photosensitive layer of the eye. It is “wall-papered” to the back of the eye and is extremely thin. The macular portion of the retina, a very small area, is the part we use for sharp, clear central detail vision. The rest of the retina, the peripheral or side vision retina, is used for mobility and detecting motion. Early signs of vision loss from age related macular degeneration include shadowy areas in your central vision or unusually fuzzy or distorted vision. 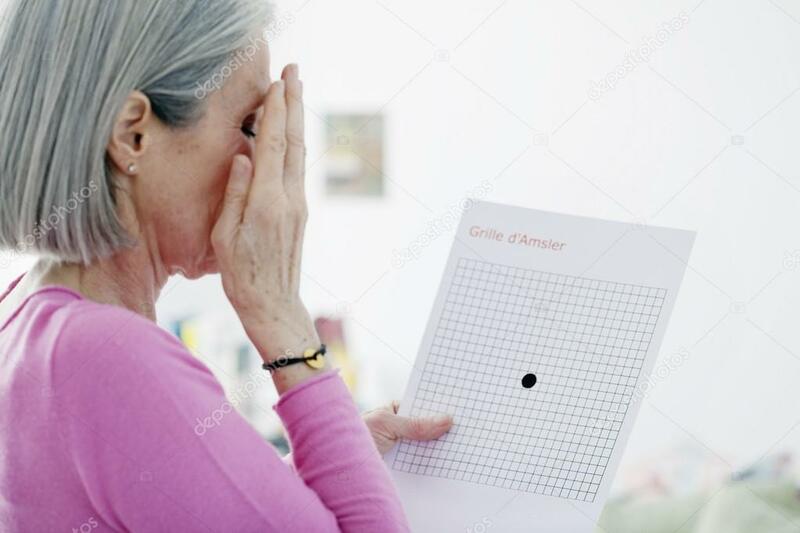 An Amsler grid is composed of straight lines, with a reference dot in the center and is one of the tools used to detect macular degeneration. Someone with macular degeneration may see some of the lines as wavy or blurred, with some dark areas at the center. Dry macular degeneration symptoms usually develop gradually and without pain. They may include: visual distortions, such as straight lines seeming bent, or reduced central vision in one or both eyes. The wet/neovascular type of macular degeneration affects approximately 10-15% of individuals with age-related macular degeneration, but accounts for approximately 90% of all cases of severe vision loss from the disease. In wet age-related macular degeneration, abnormal blood vessels under the retina begin to grow toward the macula. When the macula degenerates, whether it’s wet or dry, only the central vision is reduced. The side vision always remains. Atrophic (dry) macular degeneration is when the cells in the macular die. Causes of this can be aging, nutrition, sunlight, smoking, genetics and other causes we may not know about yet. There is simply no medical treatment. Dead retinal cells cannot be brought back to life. Retinal cells cannot be regrown, replaced, moved or transplanted. Exudative (wet) macular degeneration is caused by leakage of fluid from the blood vessels behind the macula. Because the macula has its own blood supply, only the macular area is affected. The peripheral retina has another blood supply. Treatment with injections is aimed at stopping the leak. These injections are called angiogenesis inhibitors. The two most commonly used are Lucentis and Avastin. Healthy habits are key. Maintain a healthy weight, exercise regularly. Eat a nutritious diet that includes green leafy vegetables, yellow and orange fruit, fish and whole grains. Don’t smoke and have a comprehensive annual eye exam.